The campaign to “Stop Kony” is less about removing a brutal military overlord and more about what Americans showcase as their sacred values. There it was in my inbox -- “Kony 2012” -- with a note underneath to “Please share with all friends & family.” This was my introduction to what has become a national sensation. Kony 2012 is a film gone viral, attracting millions of viewers and galvanizing them in a few short days to the cause of stopping Kony. With an easy click, people promoted the link through email, facebook and Twitter, and money poured into Invisible Children, the organization that produced the film. Mere viewers became generous contributors to a newly discovered cause. But as the week went on, various clarifications and corrections about the video surfaced. My twitter account swelled with links to articles and blog posts unpacking not only the significance of Kony but also Ugandan politics, Invisible Children’s finances, “white savior complex” and a wide-ranging call for people to wise up on the multiple issues so incompletely set out in the video. All this seems to be micro-attention to a macro-problem. Much of the growing commentary suggests the call to “Stop Kony” has dangerous levels of shallowness and misunderstanding to it. For various talking heads, the countless bursts of “retweets” and “email forward” messages only reinforce the chronic absence of sustained attention to complex social issues, cultural naïvete toward political wranglings in other continents, and a misunderstanding of global diplomacy -- all displayed through hasty calls for aggressive intervention. But this focus on “ignorance” misses the point. The campaign to “Stop Kony” is less about removing a brutal military overlord and more about what Americans showcase as their sacred values. When I look at the addresses and “handles” of people who forwarded the link, I find friends and colleagues who are not completely uninformed “idiots.” They are mostly parents and citizens, business owners and professionals, men and women who live meticulous and responsible lives. They even share a few, striking notions, such as: Children should be protected; Africa should become modernized; Overthrow of dictators is good. More subtle, but equally present, are beliefs such as: Childhood should be a time of innocence and play; The African continent is full of suffering that can and should be alleviated; Peace is a noble goal, even if it must be coercively achieved. Sharing a link for a “campaign” like “Stop Kony” provides an opportunity for sharers to let others know the kinds of values they believe they possess but rarely have a chance to display. 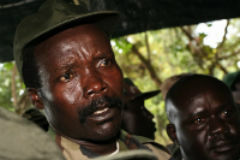 Forwarding the “Kony 2012” message shows friends and colleagues their concern for the hurts of the world. With compassion -- even sometimes describing their tears -- they vocalize their standing against brutal oppression. Emails, Facebook pages and twitter feeds are usually not anonymous; people most often know the person behind the “send” button. So when the chance comes for each of us to forward a link or to “retweet,” we consider whether we want to associate this link with ourselves, and assess its ability to define for others who we see ourselves to be. Forwarding emails and re-posting is today’s simplest means for letting people know what we care about. The little effort given to sharing a link does not deny its underlying power to exhibit our ultimate concerns, nor does the brevity of a tweet come with the intention to personally solve complex problems; it comes with the desire to participate in a sacred realm that polarizes what is “good” and what is “evil.” It’s a religious impulse. Sharers are letting their community know “this is what we should care about,” and in playing out their sadness and outrage, a sacred community draws closer together. When a link comes through social media, the key questions to ask are: What values are being announced? What assumptions about the world are left unsaid? And what is being polarized so as to mobilize and reinforce the shared power of belonging to a sacred community? Next time a link goes viral, or a campaign to correct another injustice comes along, step back for another take. And if your gut says, “Yes, other people should know about this,” and you click to continue sending it along to family and friends, know that you are participating in a sacred community guided by a set of ultimate concerns that deeply resonate with you. Gerardo Marti is L. Richardson King Associate Professor of Sociology at Davidson College in Davidson, North Carolina, and is author of "Hollywood Faith: Holiness, Prosperity, and Ambition in a Los Angeles Church," "A Mosaic of Believers: Diversity and Innovation in a Multiethnic Church" and "Worship across the Racial Divide: Religious Music and the Multiracial Church." Editor's note: A version of this post appeared originally on the blog, Black, White and Gray.